Image caption In County Offaly, Shirley Anjum caught a glimpse of the clouds. 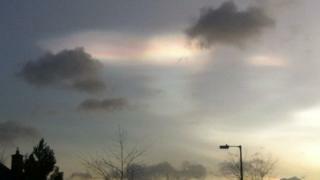 In some parts of the UK, people have been treated to a vision of nacreous - otherwise known as mother-of-pearl - clouds. Image caption Adam Charlesworth snapped this just after 8am in Leeds. Image caption Robert Leverton was in Bradford, West Yorkshire when he took this. Image caption Stephanie Dickenson tweeted: "Whatever it's called, it was very pretty". Image caption Here's Robert Bowman's mother-of-pearl in the sky. Image caption Caroline Corfield captured this image at Kingston Park, Newcastle. Image caption And @InteriorDIYer tweeted: "Woke up to an incredible little #nacreous cloud over Kilmainham this morning ☁"